As we discussed in our previous blog, produce distributors face a variety of risks in their daily operations. While workers’ compensation and automobile exposures rank as the largest risk factors for this industry, produce distributors and wholesalers are also susceptible to other exposures. 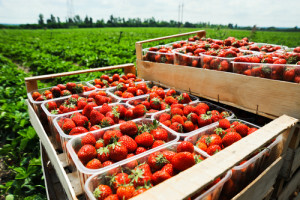 As this sector is critical in supporting Midwest Agriculture (farm-to-fork guidelines), a proper MI Produce Distributor Insurance Program, provided by a company known for their expertise in risk management and proven market relationships, is required for their success. Let us take a closer look at the common exposures that produce distributors face and how you can actively prevent claims from occurring. This policy encompasses both equipment used in transit and the products being transported. Goods in transit are susceptible to spoilage from equipment breakdown, collision, or if the vehicle is overturned. If this were to occur, very little, if any of the product, can be salvaged because of the risk of contaminating the entire load. Without this policy, thousands of dollars could be lost and never recovered. What’s more, this coverage extends to necessary equipment that the distributors often transport. For example, forklifts, trucks, and other contract equipment used to move and store products are covered under this policy if the transporting vehicle is owned by the distributor. Due to the nature of the business, these claims are high-risk. As we mentioned above, contamination/spoilage is a huge risk factor for distributors and wholesalers. Because of this, it’s imperative that you monitor the quality of the products received and keep accurate records about the inventory. To reduce the possibility of financial loss or reputational damage, ensure that any recalls are handled immediately and the source of the contamination is identified. According to a joint study conducted by the Food Marketing Institute and the Grocery Manufacturers’ Association, food recalls are most importantly a public health issue, but it is also a significant economic issue; The average cost of a recall on a food company is $10 million in direct costs, in addition to brand damage and lost sales. As distributors would suffer financial damages from these discrepancies, it’s important to monitor the inventory. If the products are compromised for any reason, it’s best to discard them. Next, safety practices should be used inside the storing facility to prevent contamination from any insecticides or pesticides that are used. Lastly, distributors should rotate stock to make sure the older produce is sold prior to its expiration date. At Capital Insurance Group, we understand the unique risks that produce distributors and wholesalers face. We have expertly crafted a policy to safeguard all of the potential risks your industry may face. For more information about our products and effective risk management strategies, contact us today at (888) 296-0418.
blog, Distributors and Wholesalers MI Distributor Insurance, MI Produce Distributor Insurance Program, Produce Distributor Risks permalink.